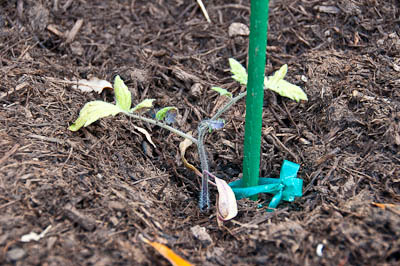 Got this spring’s tomato seedlings in the ground 3/6. Trying five varieties this time around: Black Cherry, White Currant, Sungold, Early Girl (two plants) and Japanese Black Trifele. Hoping we get better results than last fall, where I netted maybe five cherry tomatoes from all six plants. Had some fungus problems or something that wiped out the plants. Fingers crossed! Also planted some green bean seeds. I applaud your enthusiasm to get the summer planting going but be prepared to coddle if we get some more cold nights. 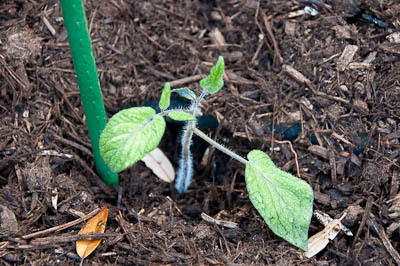 Beans really like a warm soil before they get going and tomatoes likewise. They may just sit there for a while. I suggest you get a gallon milk jug and cut out the bottom and put it round the plant to give it some extra warmth. It really is early days. Good luck. Well, I thought I was going to get the jump on Spring and get things going early, but you are absolutely right. The tomatoes look downright sad. Leaves turning purple on the underside. All signs apparently of what you are saying–too cold at night still! Had I known I would have waited a few more weeks. Hopefully they will take off once it gets warmer. I’ve only ever had “iffy” tomatoes. I got burned last year by the late blight (looks like what happened to yours, per the link) after foolishly buying a Mr. Stripey from Home Depot. It contaminated all my nightshades except for my datura. Evil! I’m trying one more time this year (a yellow pear variety and brandywine; both from seed). If they fail, I’m done w/tomatoes. I’ll stick with beans and cucurbits, who love me.